In Canada, Confidential information can be found in many different formats. So why not have a Dahle shredder that can destroy them all? With this in mind, Dahle has developed a new generation of shredders that can destroy more then just paper - CD's, DVD's, optical media. IT media and Floppy Disks! These MultiMedia IT Dahle Shredders are designed to shred between 2,000 and 8,000 sheets of paper per day as well as CDs, DVDs, optical media and floppy disks. The shredder’s contemporary design and large storage capacity make them a nice addition to any large office, copy room or communications center. The ability to shred multiple media formats is made possible by a chain driven 1 1/4 Hp motor that provides slip free power to the cutting mechanism. The cutting cylinders on these machines are the core of the shredder and are milled from a solid block of German steel. The result is a machine with strength, power, and the ability to handle all of your information destruction needs. With the Dahle 40306 Professional strip cut MultiMedia paper shredder. You can quickly destroy bulk sheets and stapled documents with ease as well as CD's, DVD's, Blu-Ray and other optical media data disks. 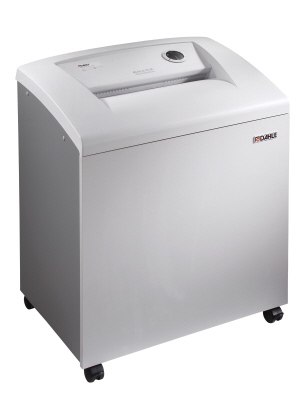 Dahle Shredders are used in Canada in almost every level of business and government. Why? Because of their reliability, durability and long life. The Dahle 40314 is a speedy small office multimedia paper shredder. This model provides a higher security rating with a cross cut shred format for destroying paper and multimedia materials. With it you can destroy CD's, DVD's, Blu-Ray data disks, smart cards - including debit and credit cards. 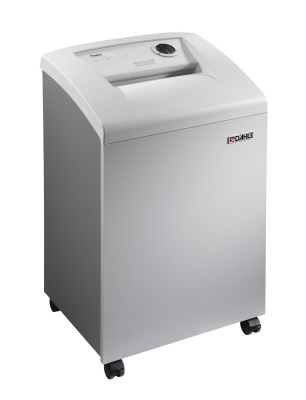 The Dahle 40406 is another new model in the Professional Series of office paper shredders. Designed for commercial business, this MultiMedia strip cut model can be used for bulk destruction. Use where a lower security level is needed for destroying paper, CD's / DVD's / Blu-Ray data disks, and credit / debit / smart cards. 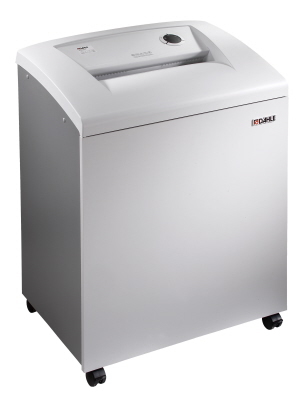 With a cross cut paper shredder like the Dahle 40414 Professional Series - high volume office shredding isn't a problem. With the higher daily duty cycle of up to 2,000 sheets per day, and multimedia shredding capabilities for plastic cards, and optical media disks - your office can destroy it all! The Dahle 40506 is a strip cut multimedia shredder for small department or work-group use. 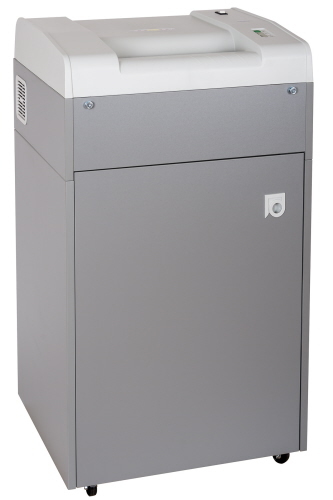 With an extra large waste cabinet at 38 Gal., it can be used in offices destroying up to 8,000 sheets per day. The throat accepts 32 / 36 sheets* at a time, and it includes a separate safety slot for shredding CD's / DVD's / Blu-Ray data disks and smart cards / credit cards / debit cards. The Dahle 41514 is a Level 4 - CD / DVD Multimedia paper shredder with the ability to destroy paper, staples, paper clips, credit cards, and CD's / DVD's. 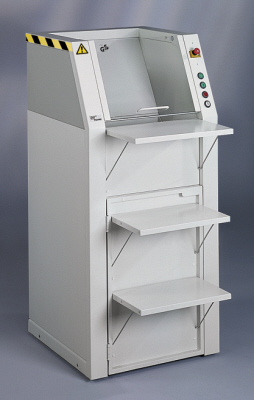 Designed for small department offices with medium security document destruction needs. The Dahle 40606 is a strip cut large department shredder with MultiMedia shredding capabilities. With a 16" wide feed throat, and extra large 45 Gal. waste volume cabinet. This Professional Series shredder will accommodate 2,000 to 12,000+ pages per day duty cycle and is designed for high volume paper bulk document and data destruction. The Dahle 40614 is a department paper shredder with cross cut multimedia destruction capabilities to destroy optical media and smart cards including: CD's / DVD's/ Blu-Ray Disks, Credit Cards, Debit Cards, and ID / Security Cards. This high volume model can be used for larger capacities where a higher security level is required. The 16" feed opening allows for both stapled and paper clipped sets to be feed into the machine. 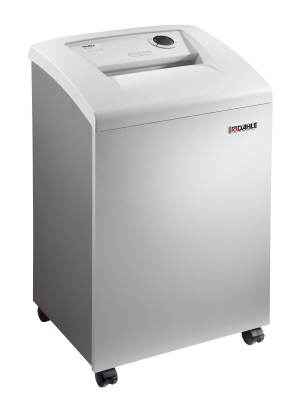 The Dahle 20390 strip cut paper shredder is an IT multimedia shredder which is excellent for offices with 50+ people. For most high capacity department and work group shredding needs, this commercial business office equipment model will allow you to shred documents quickly, with level 2 low security standards. The Dahle 20396 cross cut IT multimedia paper shredder is a high volume, large capacity model which is designed to shred over 28,000+ sheets of paper per day. The ultra wide 16" feed opening (the business end) on the cross cut Dahle 20396 paper shredder is designed to handle a high volume of paper formats used in commercial offices and IT departments today (up to 38 / 43 sheets at a time). The industrial Dahle 20452 Strip Cut Shredder model is designed with safety and efficiency in mind. The operator must insert a key in order to operate this commercial equipment, and the hopper style feed throat allows for bulk printed matter to be fed into the equipment quickly. Designed to shred over 28,000+ sheets of paper per day, the industrial Dahle 20452 strip cut paper shredder is a commercial document destruction solution. The Dahle 20453 cross cut paper shredder is designed to shred 28,000+ sheets of paper per day and is intended for offices or central building document destruction with 50+ people. It is also an IT multimedia CD / DVD disk shredder which can handle large volumes of stapled and paper clip documents or booklets.